British Advent calendars: nothing exceeds like excess | Notes from the U.K.
Hey, folks, want to spend a shitload of money celebrating something that was once supposed to be somber and full of self-denial? Well, be of good cheer, then, because we’re still in the middle of Advent—a holiday I barely knew about until I moved to Britain. I’m not sure how big a thing Advent is for American Christians. I have the impression that it’s more important to Catholics than to Protestants, but when I lived in the U.S. it was never a noisy enough holiday to have made a dent in this Jewish atheist’s awareness—and that’s in spite of growing up in a Catholic neighborhood and having Catholic godkids. I knew it existed and I knew it involved calendars, and there my knowledge ended. I remember seeing an Advent calendar at a friend’s house. It had a little window to open, and behind that a picture. What kid could resist? But the pictures turned out to be religious and I lost interest. 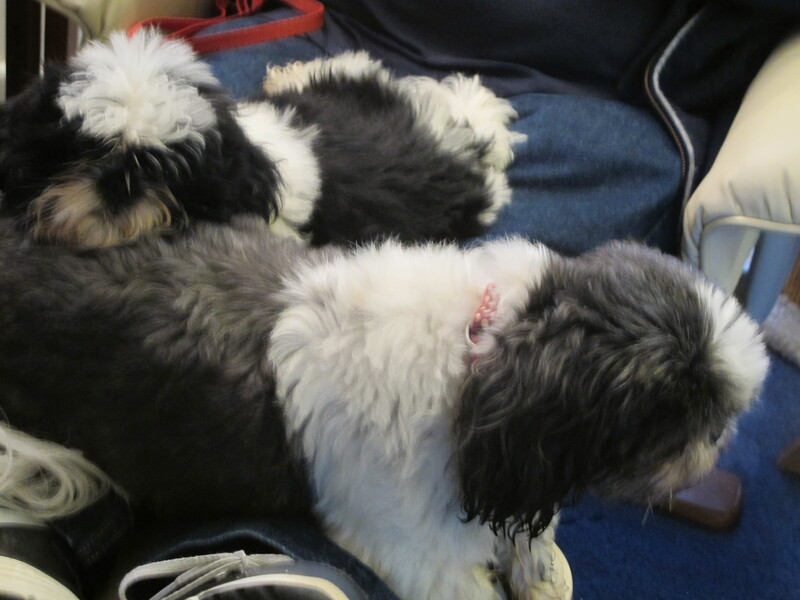 600% relevant if slightly out of focus, photo: These are the Advent shih-tzus. They bring calendars to all the good adults. Unfortunately, neither of them can read, so people are likely end up with outdated calendars. No system’s perfect and we’ll just have to live with it. Assuming I’m right about Advent being more important for Catholics than for (most) Protestants, the British focus on Advent is a reminder that the Anglican Church may be Protestant but it’s very much descended from Catholicism. The British Advent season seems to be mostly–maybe entirely–about calendars. I can’t seem to stop reading about them, because they’re not just sitting around on a store shelf, waiting for someone to buy them for their kids. They’re popping steroids and growing muscles where no one ever grew muscles before. On their hair. On their teeth. They’re—change the metaphor for me, someone, please—the mega-zombie apocalypse of all Advent calendars. The newspapers review them almost like movies. And you could go to a lot of movies for the cost of these beasties. The ones for kids might have a reasonable price tag and a piece of chocolate behind each window, but they’re making them for adults now. And not just for adults, for the over-indulged adults of the 1%. And also for the—I’m making up the numbers here, so don’t quibble—adults for the 5.6% just below them. And for a few for the rest of us who want a few minutes of thinking we can have the lives we see on TV. Should we start near the top end? I found one for £300. And what do you get for that? Some (I hate to admit it) very nice packaging and a bunch of beauty products. I just love that phrase, beauty product. You put this stuff on your face and become so beautiful no one will know who you are anymore. That nose you always thought was too long, or too wide, or too whatever? It disappears. Your wrinkles? They have such a nice skim of plaster that you look like a freshly painted wall. Beauty products are a big thing with these calendars, and one reviewer blames that on the blogosphere, and specifically on beauty bloggers. The internet’s full of them, and of beauty-blog readers, so there’s a built-in way to promote them. In case anyone needs a reminder of how commercial blogging can be—. In case it isn’t already clear, I’m not getting paid to promote beauty product calendars. That may be linked to the fact that I’m not promoting them. Also that I don’t wear makeup. I already have a face, although you can’t tell that from the photo I use. The face was installed well before I was born and it’ll have to do. It’s easy to forget how crazy our lust for stuff is (see how neatly I just included you in this) until we’re yanked outside our familiar territory and that unfamiliarity lets us look around and notice how strange things are. So the insanity of Christmas spending? It’s been going on so long it’s hard to see. But a £300 Advent calendar? The world’s gone insane. All this from a cowshed? Think Marie Antoinette. She’s out there playing at being a shepherd. Or cowherd. Or, well, she didn’t have to know her cows from her sheep anyway, did she? At a mere £90, this calendar is for commoners—admittedly, only for commoners with £90 to spare, but still, when we start with £300 it begins to look cheap. Still, it lets us play at being Marie Antoinette as we pamper ourselves during that hectic Christmas build-up. We can pretend the servants will put up the decorations. Or maybe I have Marie Antoinette mixed up with Queen Victoria, but don’t’ worry about it, because we’re moving on. If you’re beautiful enough already, or set on letting the people you know continue to recognize you, you can get calendars with chocolate (£65 for 24 mini-houses holding a chocolate each), or tools (£44, and the tools are small or they wouldn’t fit in a calendar), or socks (£79) or alcohol (£149.95 for scotch; £124.95 for gin; or, stop the press, I just found one with whiskey for a round £10,000, because once you pass the thousand-pound mark there’s no point in tacking on the change), or stationery (£90 for paperclips, sticky notes, tape, pens, and a—gack—gratitude journal). Or selfie accessories (a steal at £19.99 and who knows when you’ll need a fake mustache for your next selfie). I did my best to find out if Advent’s gone this wild in the U.S., but Google insists on telling me about Britain and only Britain. Even when I shifted to Google U.S.A., the prices came up in pounds. Lord Google knows what I want to know, or at least what I need to know, or at least where I am and therefore where he can help sell me, and he’s not about to tell me anything else. But it may also be because luxury Advent calendars aren’t a thing in the U.S. I look forward to finding out once you commenters get loose on this. The top marks for complete obscenity goes to the 2010 Porsche million U.S. dollar calendar, which included a speedboat, a kitchen, a watch, cufflinks, “fine writing tools” (presumably pens and pencils, but maybe quills, because hey, what do I know about this stuff? ), and a pair of running shoes. I don’t know how they packaged it all, but it stood 1.75 meters tall (that’s 5.74 feet, just in case you’re clearing space in your living room). They only made five and even though the price was in dollars they were sold through Harrods in London. The bakery chain Greggs made a much more down-to-earth calendar with coupons for sausage rolls, lattes, mince pies, and other fairly ordinary stuff. I only mention it because they substituted the sausage roll (with a bite out of it) for the baby Jesus in a nativity scene and it hit the press. The sausage roll looks, in the context of the Wise Men figures, very big. Maybe that’s why someone took a bite. All hell broke loose, with expressions of outrage from conservative Christian organizations and accusations that other religions never get insulted this way. Which, in a sense, is true: They get insulted in other, and as far as I can see more damaging, ways. I’m guessing the people hitting the roof haven’t tried flying while in possession of a Muslim name lately. Anyway, have a somber season of fasting and self-denial, folks. And don’t buy any Porsches until you check with me. This entry was posted in Holidays and tagged Advent calendars, Advent in Britain, luxury Advent calendars by Ellen Hawley. Bookmark the permalink. Interesting. I grew up in Catholic New Orleans, USA, and never heard of an Advent calendar till I came to Europe, although I vaguely recall some of my Catholic-ish friends telling me otherwise when I brought it up. It is more than Britain, though. I see them in the groceries in Germany, although they don’t seem to be very expensive. Not that I’m looking. Some bit of vestigial information in my brain (and yes, I do know information can’t, technically, be vestigial) roared into life as I read this and swore that Advent calendars reached Britain from Germany. I have no idea if that’s true, but for what it’s worth (very little, I suspect), there it is. Definitely German in origin. Even in my childhood in Canada, our chocolate advent calendars were labelled in German first. Thanks for tossing that into the discussion. I have no idea why I thought that was true, but I’m glad to know I didn’t entirely invent it. Sod Advent, the more interesting thing is at what stage can we get hacked off that Googling stuff is only returning you stuff Google wants you to know? I used Bing (Bingled?) and DuckDuckGo (Duckled?) and found that you can buy a Playmobil Advent calender on walmart.com. Very reasonable at $173.99 but a small caveat is that it is from 2002. Do hurry if you want it though, there’s only one left so not too long left to be only 15 years late – or save it for 2023 when the dates fit it again. I wish I’d dug deep enough to find that. I’m eaten with envy. And I agree about Google. If I get a day with time, sanity, and lack-of-laziness, I’ll try Duckling and Bingling. In this weather, a lot of the joy drops out of scaring people outdoors. Advent calendars have started to get hectic in Australia too, and it was just recently I was looking at an Instagram post for one of those beauty advent calendars, and thinking to myself, why??? As if we haven’t got enough crap to buy at Christmas time without adding in tree-shaped calendars full of luxe beauty items. Side note, but I really despise that word, luxe. Makes me want to roll my eyes and flip the bird, simultaneously. I loved your post, and thoroughly share your sentiments. Oh, I wouldn’t say that’s a digression. Flipping the bird’s right on topic around here. As is rolling your eyes. Fair enough. It has been said, although I doubt we’ve got enough readers here to put a dent in her sales. I am not sure how they would fit a speedboat and a kitchen into a 1.75m tall advent calendar… and what would you do in the mornign when you ended up with a whole new kitchen on your kitchen worktop after it popped out from behind the little door? I wondered about the speedboat and the kitchen myself. Not to mention how you get the speedboat out the door once you’re gotten it in. Excuse me, I’ll just go see if the staff’s managed to get ours outside…. First class job I say!! I’m afraid I couldn’t bring myself to read all of this, no offence to you and your writing ;-) This Advent calendar business makes me sooooo annoyed I started seething. Yes, I was brought up Catholic and had advent calendars of the ‘open a window and find a religious picture that is part of the story leading up to Christmas’ kind. Advent is not a holiday. A little like Lent, it is a time of leading up to and preparation. In my days of yore it was a time of saving up pocket money, praying for snow and sending letters with present desires up the chimney to Father Christmas and hoping the flew up an didn’t burn. And going to church of course. Now it’s just more excess. Bah humbug! Understood. I find it all fascinating, in a horrible sort of way–a bit like the triple-digit Easter eggs I’ve written about for a couple of years. A sign of the craziness of our times. This year we have a Moomin Advent calendar with a Moomin character sticker behind each window. It only cost a couple of quid at a Christmas Market, and since the Moomins come from Finland, the official home of Santa Claus, it at least has some semblance of leading up to Christmas. As for the calendars of beauty products and the speedboat calendar, well I recently listened to a podcast of BBC Radio 4’s Costing the Earth programme a few weeks ago in which the proposition was aired that we’ve now reached peak stuff (in the developed world at any rate). This lead me to the thought that producers of stuff are probably getting ever more desperate to sell us said stuff, by any means possible, and Advent calendars are just one more way of doing this. Peak stuff. That strikes me as a useful concept about largely useless things. At some point, you’d think we’d notice that it’s not making those of us who have it happy, but the marketers are awfully good at their jobs. I wonder if we’ll listen to ourselves instead of being driven. I thought Santa Claus lived at the North Pole. Has he moved? Did he and Mrs. C. split up? Well the Finns seemed to have laid claim to Santa in recent years. They probably offered him a Tax haven so he doesn’t have to levy VAT on his delivery charges. Nothing’s impossible these days, although I didn’t think Finland went in for that sort of tax shenanigans. Awe, this is hysterical! I grew up in New Orleans as an Episcopalian, and we sometimes had Advent calendars at home when I was a kid, but it was never much of a big deal. I can’t get over the beauty product calendars! What the hell?? It’s a strange way to mark a holiday of, um, self-denial, isn’t it? Also, if I got one, I couldn’t help thinking someone was trying to throw me hints: Hey, you, you could use some of this stuff. As we are all rocking along towards Christmas, you might enjoy this Absolutely hysterical article on Advent Gone Wild in Britain. Advent is definitely a Catholic thing. It’s a big thing here in Germany, in Poland too, so that explains it. I’m not really sure if Evangelists celebrate it though since Germ. is 50-50. I tend to forget how much of Germany is Catholic. Chalk that up to a heavy load of ignorance about many things German. Canadian Protestant here and & we always had Advent calendars. I do have an Advent calendar however it’s more traditional – it’s a box of boxes that I fill up. Some years it contains foil-wrapped Santas, other years it will be something nicer, but always chocolate. What a great idea: a self-recycling Advent calendar. Even though I don’t mark Advent, the idea appeals to me. I only became familiar with Advent Calendars after I married into a Catholic family. I escaped that group, but spent some additional time in that church. On and off, we had an Advent Calendar in our house, but I have to admit, I seem to remember our daughter making it, or it being given to her in the Catholic school she was attending. £300 for a calendar seems excessive by any measure. Especially given what should be the meaning and spirit that the thing should inspire. I guess, if you can make some money, you do what it takes. You do have me wondering if I should embrace beauty products on my blog. Do you have to be beautiful to do that? I think I might fail. Deep question there, do you have to be beautiful to endorse beauty products. Off the top of my head, I’d say I’m the wrong person to ask. I’m not convinced that the people underneath all those products are beautiful–and I mean with them, not without. So, yeah, what do I know? I prefer to wear all my scars and wrinkles like a badge of honor. I don’t think the overly made-up folks are even attractive. I’ve never really seen any point to advent calendars (apart from the fun of opening little doors and hopefully finding something nice behind them) but then I wasn’t brought up with this tradition anyway, but I’d have thought the best way to get kids into them is to encourage them to make one themselves, each year. That probably applies to a lot of things. If they make it, it matters. If it’s effortless, who cares? My darling son got a lego advent calendar this year, £19.99, so we are doing a reverse advent calendar and he gets to put old toys he no longer plays with in a box and we are donating them. After reading your post I took a little while to consider whether I could invent an Advent calendar more ridiculous and…stupid…and…you get the idea, than the examples you came up with. I couldn’t. No, but it’s always good to have a challenge. Little Baby Sausage, laying in a manger… that’s how I remember it. That must be one of the Christmas songs I didn’t learn. LOL. BTW, I was tortured with Southern Baptist propaganda as a child. Sometimes we had the Advent calendar. There was only one piece of chocolate, behind the very last door. The rest were religious images. Very boring. Especially when I ate the piece of chocolate on the first day. That answers my question: What keeps a kid from opening all the doors at once? Or, for that matter, an adult. Sorry to hear about your childhood trauma. That couldn’t have been easy. Growing up mostly in Virginia, 1960s-70s, I heard of Advent calendars but never saw one in real life. However, an e-friend’s last, least science-fictiony, but in some ways strangest, novel (Peacetalk 101 by Suzette Haden Elgin) features an Advent calendar. Maybe they were or have become more familiar in the Midwest. Could be. I’ve been gone for eleven years now. A lot changes in that amount of time. Baby Jesus as a sausage roll in a manger is the best thing I have read all December and actually gives me more mirth than anything else has so far this festive season. I am a lifelong atheist brought up in a non-denominational, somewhat spiritual but non-specific family so I was brought up on secular Christmas and that is what I have continued into my own parenthood/family life. Advent is a part of that, for good or for ill. When I was a kid, my multitude of siblings and I took turns to open a door in a card calendar and we looked at the festive pictures inside. By the time I had left home at 17, my younger siblings were finding chocolate behind those doors. Clearly Advent was being commercialised even then. I started off Advent with my kids as the simple door opening thing, as a way of counting down to Christmas, but then my Mother-in-Law found an admittedly charming wooden box box containing 24 drawers and our tradition changed. She would fill it up with little trinkets and gifts for my four kids (taking turns so they got six gifts each, not 24 apiece) and that was fine. Then we emigrated and that meant grandmother was on another continent and the job of filling the wretched drawers fell to me. It is a total pain in the arse to find 24 affordable, small drawer sized gifts every year. I refuse to buy tat that is just going to clutter the bottom of a drawer or be abandoned on the playroom floor so it is a real challenge each year. I, therefore, have become very bah humbug about advent calendars and look forward to my children outgrowing the tradition so that I can retire from filling those drawers. As for grown up or luxury advent calendars, I have no direct experience of them but one of my sisters is enjoying having a gin advent calendar. Gin seems to be the drink of the moment. Go figure. I thought the stuff all tasted pretty much the same. But a little bottle a day might take the sting out of having to fill all those drawers. I do miss Advent Calenders over here I must admit, we had a family tradition that after my eldest sister left for college, every year she would send us wee ones an advent calendar. She continued right up until I left for the USA even though I’m no longer wee in any sense. Luckily one of her final calendars was a Marks and Sparks village of little houses and cute animal cut outs, which I use every year still here. I’ve no idea how relatable the C of E is to Catholicism, certainly I live in Fish Fry Friday, Catholic country now and see no advent celebrations at all. Of course being 50 and British I can tell you all you need to know about advent is from the book of Blue Peter and requires two wire coat hangers, lots of tinsel and 4 candles! Of course. After the three wise men came the three handymen, bringing coat hangers, tinsel, and candles. Even I learned that much. I grew up Catholic, but have only a hazy memory of Advent calendars. But then, that was many decades ago and they probably featured religious pictures, not chocolate. But now — Canada is on the verge of legalizing recreational pot (marijuana, but pot is easier to type), so of course some entrepreneur began selling an advent calendar featuring pot. A different strain behind each of the little doors, I’m guessing. Oh hell, what comes next? I didn’t even know that luxury Advent calendars were a thing. Like so many things associated with Christmas, they’re missing the point. If they can sell us something, I’m sure they consider that the point. I admit, that’s not news. No one could make up this stuff! Beauty products in an advent calendar? Sausages? Laughing at the unbelievable! Well, in fairness, I don’t think they’re physical sausages, which start to smell pretty quickly. I think they’re just coupons. Although I kind of like the idea of the dogs and the cat getting into the calendar–no, they wouldn’t wait for the right date–and having a wonderful time. A chance like that would probably be enough to convert their mercenary little souls. Saturday chuckle this time. Too busy yesterday, doing Christmas shopping of course. Mea culpa! I have fallen into the fancy advent calendar trap, for my wee daughters who are now big. Occitane has done a luverly big one with your aforementioned beauty products behind each little door. But it’s only to stop my dearest girlies getting spots from the chocolate ones they have had for the last few years, and also saving me the trouble of filling up twenty-four silly wee boxes with tiny crap that took me days to find when they really were little. I liked the idea of little boxes a person fills themselves until I read your comment and PictInPA’s about what a damn nuisance it is to find things that fit inside them. Somewhere in my family tree I was given an anti-religious gene. It’s left me with a hefty aversion to all things Christmas. My late husband insisted on lighting the yard up to the point of being visible from outer space. I am SO tremendously happy I don’t have to put up a single bulb these days. I’ve decided to do an “Adent-ure” calendar instead. It will be a countdown for when all these silly holidays will be over and it’ll be safe to move about the country once more! ;) Perhaps with little beer steins behind each door… or something like that. It does get to be an onslaught at this time of year. Well, they were good-looking socks, but they also looked like thin socks, which I don’t have a hell of a lot of use for. Maybe that explains why Christianity’s never much appealed to me. I found it strangely comforting to read about the absurdity and excess of British advent calendars. I thought America had cornered the market on both excess and absurdity. But I learn now that preposterous knows no nationality and extravagance cannot be confined by borders. I only wonder how long it will be before the America-Firsters seek and claim supremacy here, too. Until that day, I hope advent calendars celebrating pointless acquisition and greed will stay on your side of the Pond. You do make it sound oddly comforting. I’ll take to cheering on what I’m convinced is the wrong side in this race toward more, more, more pointless stuff. I am so sorry I didn’t read this before Christmas. As a practicing Episcopalian (the Anglican in the US, so to speak), the only Advent calendars I have ever seen are either religious pictures or chocolate. And some folks were not thrilled when chocolate replaced the pictures. Walmart doesn’t carry them, so as far as I’m concerned they don’t really exist here. Gee, I’m sorry too. You could’ve ordered one of those with the car, the kitchen (how do they fit it in? springs? vacuum packing? ), and the penthouse. Did I say one? Half a dozen. I mean, c’mon, it was Christmas. Anyway, a belated Merry Christmas. Or an early one for next year. I’ll save up and send you the money. I’m sure I could figure out something not only useful but socially responsible to do with it. Such cuties, these pups. Mine doesn’t read either. Alas! I don’t know what it is about dogs and reading. They never seem to get the point of it. How I’ve tried to read to him in bed, to no avail, just puts him to sleep or go for a chew toy instead. Have you considered getting a cat instead? No, my apartment is too small for a litter box. Isn’t this the lamest excuse you ever heard? You have a cat? Does it read? I do have a cat–Fast Eddie. Of course he reads. You’re not calling my cat illiterate, are you? I wouldn’t dare. Eddie must be a super smart miao miao. Very smart. Now if only I could convince him not to bring dead mice into the house. You ever try arguing with a cat? You never win. Never argue with a cat because he is always right. Dead mice, haha, I think it’s very kind that he shares the reward with you. He thinks so too. I haven’t been able to match his enthusiasm. No problem. I end up carrying on a dozen or so scattered conversations at once here and even if a reply comes in quickly I have to go back and remind myself what the hell we were talking about.